Leave it to Nickelodeon and Paramount Home Media Distribution to release another one of my favorite series from the early 90's. I remember watching Rocko's Modern Life with my two brothers after school. There was something about this series which left us laughing and wanting more episodes of this classic series. We would into school the next day and talk to our friends about the show and our favorite parts. And, now, over 25 years, this Nickelodeon fan-favorite is now available for fans of the show to pick -- just in time for the holidays -- and binge watch all four season, spread out over 8 DVDs. I received an advance copy of this series and have been sharing it with my husband and girls. I love sharing my favorite childhood shows with them, and seeing them get into them like I did as a kid. "Nickelodeon's fan-favorite '90s hit gets a full series release with Rocko's Modern Life: The Complete Series, available on DVD November 20. This 8-disc collection features brand-new packaging designed by the series creator and contains every episode from this hilarious animated series, which originally ran from 1993 to 1996. 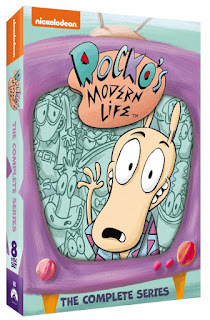 Rocko's Modern Life: The Complete Series has over 20 hours of Rocko, Heffer, Filburt, Spunky, and the Bigheads as they explore the ups and downs of everyday life in the city of O-Town. Fans can enjoy classic episodes such as "Carnival Knowledge" and "Flu-In-U-Enza," and relive all of the adventures and life-lessons from Rocko and his friends, including the dangers of garbage day, the disastrous results of Heffer eating too many Pasture Puffies, and Filburt struggling to save his soul after opening a not-so-fortunate fortune cookie. Produced by Nickelodeon Home Entertainment and distributed by Paramount Home Media Distribution Rocko's Modern Life: The Complete Series will be available on DVD November 20 for the suggested retail price of $33.99. "